Oftentimes we get calls from customers who don’t see visual mold in their homes, but they have a high mold spore count in the air. Yes, mold can be airborne and home inspectors find this when they take air samples and run air quality tests. Usually the homeowner’s first question for us is, ‘How can I have mold if I don’t see it?’ The answer is simple, mold is living in the air. As mentioned in our previous post, mold favors areas of the home with moisture intrusion and high humidity. Usually it is found airborne in the basement with no visual signs but high humidity over time has caused it to grow. Even with a dehumidifier running in the basement, mold can grow because normal sized dehumidifiers are not large enough to control the humidity levels in most basements. When we get calls about a high mold spore count in a home, we do an inspection to see if the home inspectors missed any visual mold. If not, we simply use our hospital grade fogging chemical diluted with water in a fogging machine and fog the entire house including the attic and crawl space. After fogging, we turn on our Air Scrubber with a HEPA filter and leave it in the home overnight. This further cleans the air and ensures mold spores are reduced to a healthy level. If you or members of your family are feeling sick or allergic maybe you should have your air tested for spore counts! 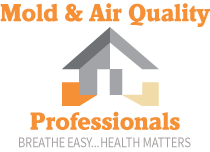 We do air quality testing in addition to mold removal!